John Twigg, newly appointed Leader of the B.C. 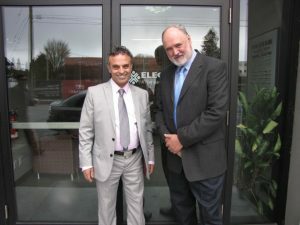 First Party, and party President Salvatore (Sal) Vetro will be available to answer media questions and do one-on-one interviews in Victoria at about 2 p.m. today (April 13) outside the offices of Elections BC at Fort and Cook Streets (1112 Fort St., suite 100), and later – about 3 p.m. – in the Rose Garden of the Legislature. The event will follow Mr. Vetro’s formal transfer of the party leadership to Mr. Twigg, who until recently was volunteering as Director of Policy and Communications for the B.C. Conservative Party, and Twigg also is now running for B.C. First in the North Island riding from a campaign office in Campbell River. “I decided to change parties when it became apparent that the B.C. Conservatives were not going to enable me to advance my policy package of about 50 major innovative reforms and that was regardless of whether or not they named me interim leader,” said Twigg, a 68-year-old semi-retired journalist with a long history of activity in B.C. politics, media and public affairs. “I am very grateful to Mr. Vetro for letting me become leader of his party, especially because it was founded about 30 years ago by a very close personal friend of mine, the now-deceased Roger Rocan, and also because the party’s ethos of putting the public interest first is a very close fit with my own political orientations,” said Twigg, who has been active in B.C. politics for about 50 years and was most widely known as Press Secretary to former NDP Premier Dave Barrett from 1972 to 1975. “I’ve had an interesting career in politics and media, including 10 years in Saskatchewan as a financial editor, but now I want to use this 2017 election in B.C. as an opportunity to inject a whole bunch of innovative policy ideas into the election campaign,” said Twigg, citing the suggested new ferry crossing from Gabriola Island to Sea Island that he and the BC Conservatives unveiled a few weeks ago in Nanaimo, and his proposal to revive the Bank of B.C., the B.C. Treasury Branches and the B.C. Government Agents services along with the launch of a new made-in-B.C. parallel currency as a means of stimulating the economy, slowing the depopulation of remote communities, paying for new or expanded social services and providing economic security in the face of a possible global financial collapse – among many other novel ideas such as reviving regional log markets, exporting surplus fresh water on an auction-only basis and moving towards full employment such as with expanded child care and expanded home care for seniors. Vetro expressed pleasure at finding someone with drive and vision to lead the B.C. First Party, which he had kept alive through several elections since the death of Rocan; it was briefly used by former premier Bill Vander Zalm but to date has not yet elected an MLA. “The way this year’s B.C. is election is unfolding gives me hope that John can win his seat in North Island and then make a positive difference in the Legislature regardless of which party wins the election,” said Vetro, noting that Twigg’s 15-year-stint as a member of the B.C. Legislative Press Gallery from 1986 to 2001 has given him many useful insights into the operations of B.C.’s government and finances as well as the B.C. economy. “It’s obvious that B.C. needs a new direction now and the prospect of small parties holding a balance of power or obtaining official party status bodes well for the public interest soon being better served in Victoria,” said Vetro. “With the election outcome expected to be even closer than last time, there’s a growing possibility that small-party candidates and independents could hold the balance of power in the next Legislature and that could make a huge, positive difference in B.C.’s future,” said Twigg.